Advertising in the blogosphere, and indeed the web at large, is driven by page views. And Google, which also relies on page views and unique visitors to make money, is one of the best traffic generators. is not easy since you are competing with other bidders and Google’s algorithm. Thus, many top tier blogs have begun to rely on a different source of traffic – the web’s number one social news site Digg. instantly flock to the source site as soon as a story hits Digg’s front page, causing traffic to spike on web sites well higher than usual levels. we look at what Digg is today, beyond its bare front page, and look into what Digg’s future holds. The concept behind Digg is simple. Any Digg user can submit a news article pointing to a page on the web. a link to it is published to the front page of the site. Despite its simple description, the actual algorithm has considerable complexity. game search engines using SEO, people have been trying to game Digg, so the algorithm itself is constantly evolving. Valleywag just recently published a post explaining how Digg’s algorithm works in 100 words. Naturally, the post itself made the Digg front page. User participation: The algorithm takes into consideration participation history of the submitter and each voter. Submitter track record: Previous success makes it harder to succeed again. Diggs from top users: Rapid diggs from top diggers cause a jump to the front page. Number of votes: How the number of votes on the story compares to the average number of votes on any story. Category: Stories in Technology have more competition than in Sports, for example. Velocity: The faster diggs come, the more likely for the story to pop to the front page. Comments: The number and the substance of the comments counts as well. it originates 54,000 clicks per hour or 1.3M clicks per day. This is a huge number. 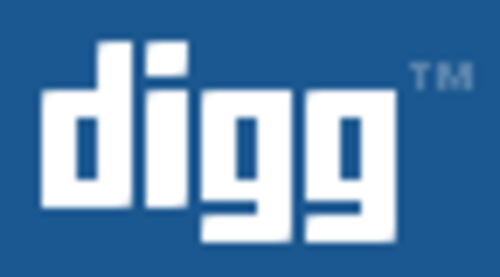 We know that Digg hit 1 million registered users back in March. there are at least 3,600 people at any given time who are actively watching front page. game of information dissemination on the web. that Digg plays in the news ecosystem. come to aggregators like Bloglines, Google Reader and Netvibes. Another flow is to the automatic popularity sites like Techmeme. Unlike Digg, Techmeme is powered by an algorithm and computes popularity of stories based on the number of sources talking about it and linking to each other. and stored permanently on sites like del.icio.us. The most interesting path is of those stories that get to the front page of Digg and then get stored on sites like del.icio.us. this path in its index, giving a heavier weight to these results. major principles that they discovered is the principle of Self-Organization. 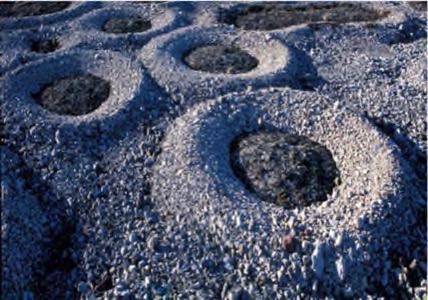 Self-organization is a truly remarkable phenomenon present in diverse physical, biological and social systems. The phenomenon is at the very heart of how a galaxy forms, how ants cooperate in colonies, and how humans form societies. chemicals that seem to explain the origin of life itself. the system is not entirely self-regulating, since the company had to improve the algorithm to protect the system from abuse. underscores that Digg has a life of its own. self-organizing systems that actually works; it is a filter which sifts a lot of the the signal from the noise of the web. competitor will emerge to overtake it. Likely, more and more sites will continue to incorporate story voting. But that is not really a threat to Digg. 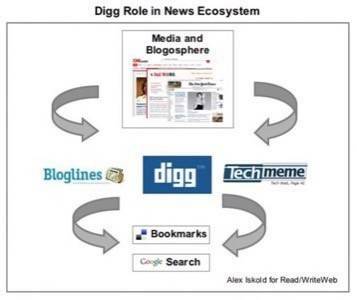 The whole point of Digg is that it is a web-wide news filter, so silos can not rival it. This is what a lot of people miss – the magic is in Digg’s distributed nature and aggregation, not in the ability to vote on the stories. 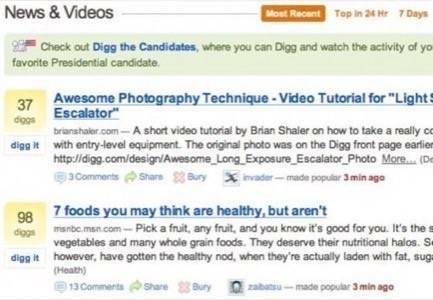 How do you use Digg? What do you like and not like about how it works today? Let us know in the comments below.